First things first, as they say. Tickets to this event sold out yonks ago. However, if you don’t mind the risk of getting nothing after a day of hanging around, and consuming vast quantities of coffee while you wait, then you can turn up and hope (nay, pray) that someone woke up with a crashing hangover and decided not to use their ticket. To be frank though, the chances of getting in are going to be vanishingly slim. There is a Cafe Nero nearby, and the George pub opposite Court of Justice has lovely House of Lords style seats at the back. Fortunately, I had a ticket, and today marked my third trip into Aldwych tube station since it closed down. The most recent was for the ticket hall only exhibition about the upgrade plans for the tube network and a few years ago I had a special guided tour of the whole place. Wearing my “tube geek” hat, I would say my previous visits were better as I got to see a heck of a lot more of the station and at a more sedate pace. Putting on my general public hat, today’s visit is a rare chance to go down to the bowels of the station and the entertainments are Jolly Good Fun. 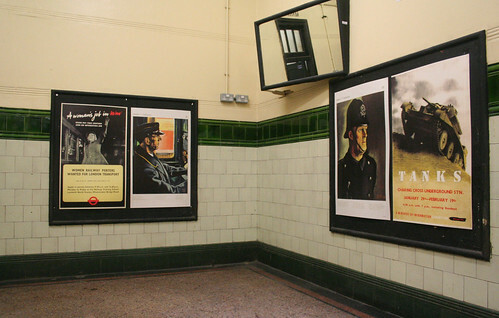 Once you are shuffled into the station, and handed over any large bags, there is an introduction from an Air Raid Precautions officer, who sternly admonishes us for not bringing our gas masks – nor our blanket and bucket. Well, when was the last time you saw a toilet on a tube platform? 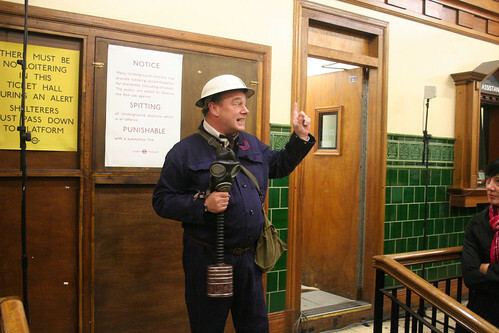 Then with the distinctive wail from the air raid siren we are told to head on down to the platform. No need to rush, the bombers will take at least five minutes to get to London now that they have been sighted on the approach. Down here, by the lift shafts,which are now firmly out of use, the prim and proper lady in charge of the shelter again told us off for not bringing our buckets and blankets and splitting the largish group up into smaller more manageable groups sent us off down the lengthy corridor to the platform below, past the green locked metal doors that lead to the other platform. 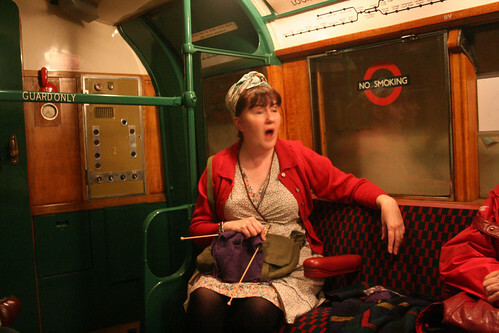 Down the stairs and waiting for us in the atmospheric gloom was the lovely 1938 era tube train. I’ve been on that train loads of times, but I still love it to bits, and the reaction of the rest of the people I was with indicated they were also excited by the sight of this old beauty. The train has also had its 1980s adverts and line map covered over with warnings about the blackout and a line map more suited to the 1940s. Here, we are shuffled between carriages for three more talks by actors playing the role of a housewife, a spiv, and the aforementioned stern officer in charge. All good fun – if a bit too interactive for my personal taste. That’s just me though – everyone else seemed to really enjoy the acting, and it was quite informative about life during the wartime blitz. Suddenly the bombs started falling and we were hurried out of the train and onto the platforms for safety. As the tunnels flashed with the explosions and the housewife cried in terror, the other two led us in a rendition of war time songs to lift the spirits. As the whole thing ended, a pre-recorded voice read out that in September 1940, and (I forget the exact numbers) 5,000ish people had died, around 9,000 were seriously injured and half a million were homeless. The sombre mood in the tunnel was then slightly spoiled by the recording then encouraging us to visit the Transport Museum and City Hall for a couple of exhibitions. Would have been much better to stop at the casualty list and let us leave the tunnel with that reminder of the horror of war as our last lingering experience. Upstairs and back out via the original exit – and past a souvenir desk they have set up. If you fancy a book, they are selling copies of London’s Secret Tubes, which is in my experience one of the best books on the subject – and I have read a lot of them! Overall, a fun and memorable hour or so at the station – and as noted by another visitor, the museum is looking to try and do something on a semi-regular basis in the future. I would say just touring the history of the station will be enough for most visitors as it is quite fascinating on its own. More photos of today’s event over at my usual Flickr account. As mentioned above, I’ve been in to the station before for a more through look around – including the other, even rarer seen platform. Photos of that tour are here. ‹ A museum for the Emergency Services? Looks quite good, I take it you are able to take pictures with a normal camera? Always wanted to take a picture in an old station. Cant wait till tomorrow morning. I’m going tomorrow and after reading your review and some of the other write ups I can’t wait. I would be interested to know what size of camera you are allowed to take down? I have a small DSLR, nothing “professional”. Is flash allowed? Flash was allowed – although it was quite annoying in the dim light when people used them. I prefer to use a high ISO and fast shutter to get better images anyway and save flash for when it really can’t be avoided. My camera is fairly decent, and no one complained about it – just no tripods or video was the only stipulation. Great Tour, All camera’s are allowed but no tri-pods or video. The only thing I did not like was the way the staff watched every body and walked forward when ever to left the train cartridge to take a picture while the actress was talking. I got loads of pictures, some have orbs, maybe its a ghost!!!!!! Looks as if the actors are on shifts, The actors up top and the lady greeting people at the bottom of the stairs were different than the ones in your pics. I almost wanted an emergency to occur at the top of the station, which would mean we would be able to walk through to holborn. I did hear part of a conversation between staff and a customer. I only heard “First time” and “in the future”. A more detailed full tour at double the price is sure to be the next move of the LTM. bowroaduk has some pics of the filming train that usually lives in Aldwych being taken out via Holborn earlier in the week, and some more pics of the 1938 train coming in another day. Nice that LT went to the effort of swapping the appropriate train in to place for the event as it obviously took a bit of planning. I was there on Sunday. Very worthwhile, for the money anyway. I was waiting for a joke about ‘Whale meat again’, which never came. Shame we didn’t get to see more of the station, but it did fulfil the stated aims. Definitely agree about the recorded announcement at the end. The ‘5,000 died’ thing brought a tear to my eye, and it was a sombre moment spoiled by commercialism. The air-raid sirens always make my skin crawl – the memories of my grandparents, perhaps, although I get the same feeling with the Protect and Survive noises at the IWM. The IWM blitz experience is good too. 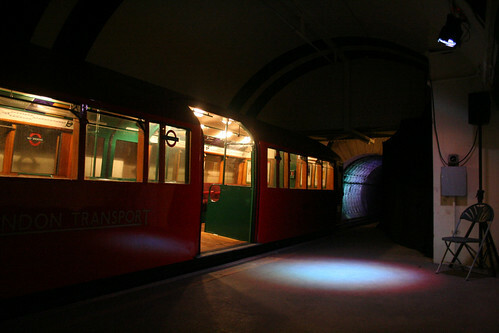 6 Pings/Trackbacks for "The Aldwych Tube Station Blitz Experience"